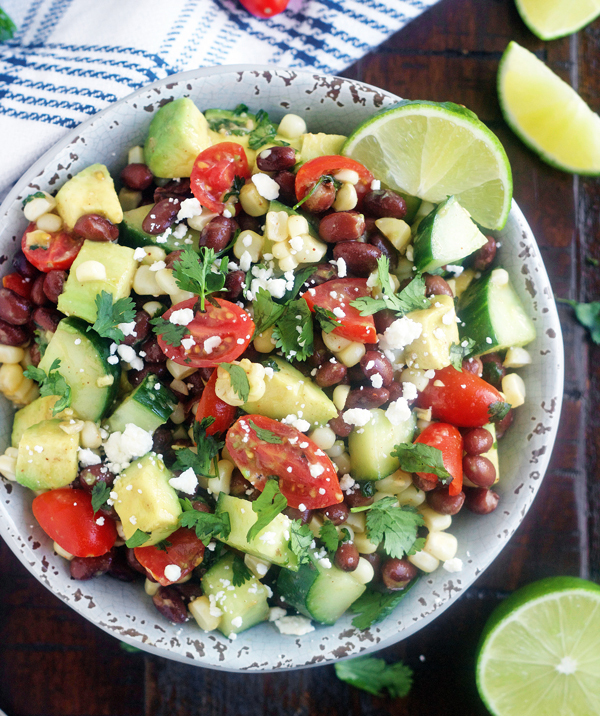 Incredibly delicious and packed with so many healthy ingredients, this Avocado & Black Bean Salad with Lime-Cumin Dressing will be the hit at any party. Perfect as a side dish or can be eaten with tortilla chips. 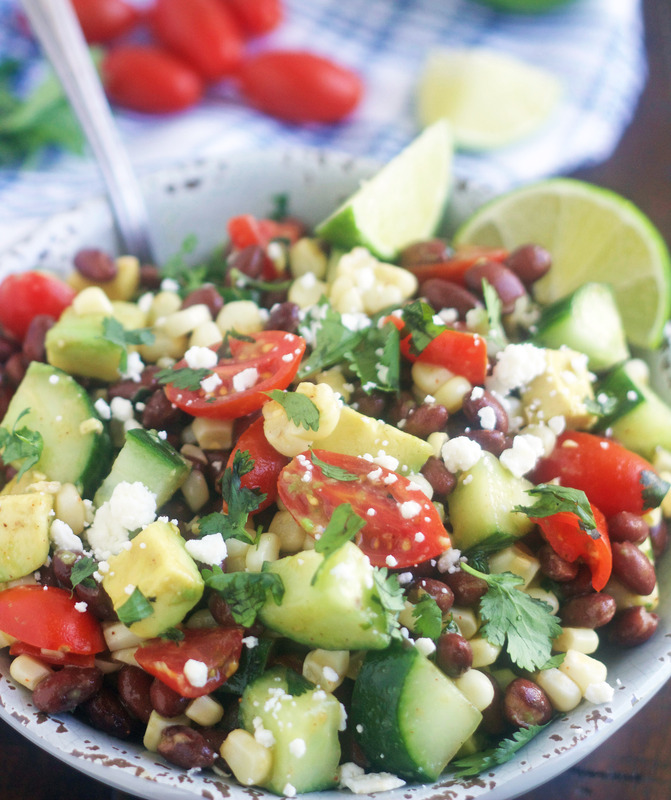 You guys, this Avocado & Black Bean Salad with Sweet Lime-Cumin Dressing is absolutely amazing! I could eat the entire bowl every time I make it. 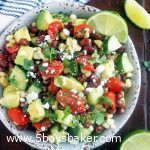 The dressing is fabulous on it’s own, but poured over a bowl of avocados, black beans, cucumbers, tomatoes and corn . . .HOLY YUM! These kind of salads are my favorite to eat this time of year. They’re packed with fresh, delicious and nutritious ingredients and then tossed with a fabulous dressing. My friend brought a salad to a girl’s night and I immediately fell in love with the dressing. As soon as I tasted it I knew it would be delicious poured over almost anything. If you’re in a salad rut and want something amazing, you need to make this. It’s basically fail-proof and you will be addicted. Another bonus of this beauty is it can double as an appetizer and be served with tortilla chips and/or crackers. I personally love it on it’s own because it’s just that good . . . no chips required. I could literally make a meal of this, but serve this with some grilled chicken and you have the perfect summer meal. Make this, I promise you will love it! On a side note, I’m NEVER turning 50!! My husband just had his first colonoscopy yesterday and I think he spent more time in the bathroom in a 12-hour period than should be humanly possible . . . LOL! The great thing about this salad is you can make it all ahead of time. I like to make the dressing in the morning and let it chill in the fridge all day. I also mix the salad ingredients all together (EXCEPT THE AVOCADO) and cover it with saran wrap and let it sit in the fridge. About two hours before serving, I pour the dressing over the salad and toss until it’s evenly coated then I put it back in the fridge for a couple hours so the flavors meld. JUST BEFORE serving, I cut the avocados and gently toss them in (if you add them too soon, they’ll start to go brown). I only use about half the dressing for this salad and save the remaining dressing for another time (it’s delicious over a green salad!). I would start with about half and then add more if you feel like your salad needs it or you just want more. You definitely won’t need all the dressing. I love to use fresh ears of corn for this salad. You blanch them by brining a large pot of water to a boil and then place the ears of corn in the water. Cook for 4 minutes and then remove ears of corn and place them in ice cold water to cool, the cut the corn off the cob. You could also use frozen corn or canned corn. Use about 1 to 1 1/2 cups. This salad is best if eaten the day it’s made. 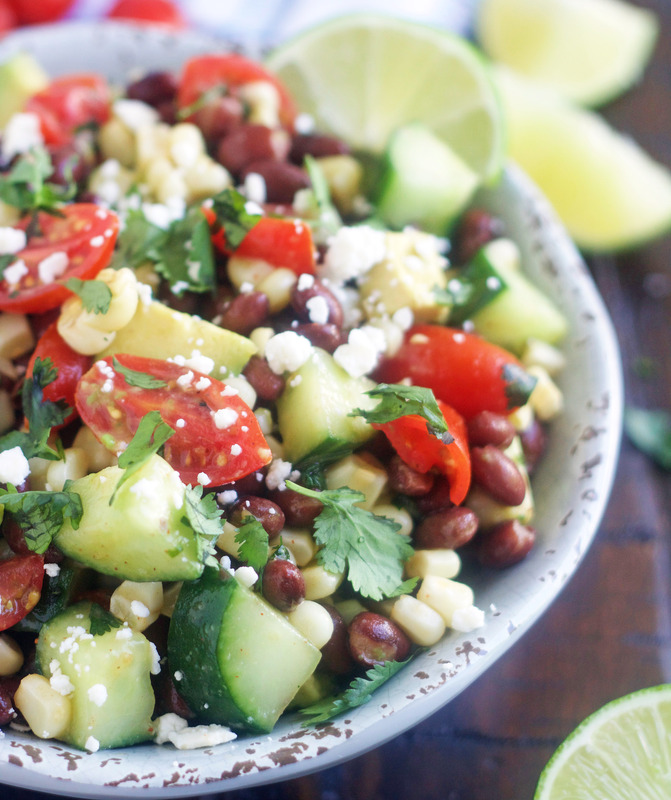 SALAD: In a serving bowl, combine black beans, corn, cucumber, tomatoes and cilantro and mix well. **Don't add avocados until just before serving. Whisk dressing and pour about half over the salad (save remaining dressing for later use). Chill for at least two hours. Just before serving, peel and dice avocados and gently fold into salad. SPICE MIX: Mix all ingredients together well. Keep remaining spice mix in a Ziploc bag and store for next use. This sounds SO delicious! It looks like there is some cheese sprinkled on top in the photos. What kind – queso fresco, Cotija, feta? Can’t wait to make this! Hi Stephanie! I just sprinkled a little feta on top, mainly for pictures. I don’t think the salad even needs it, but you certainly can sprinkle any of those cheeses on top. You will love this, it’s so fresh and delicious!